Warning: What works in one context (place/time) may not work in another context. We have tried to provide an indication of how confident we are that particular advice will apply in particular contexts, but you must always evaluate the extent to which you think any advice will apply in your particular context. You use the information on this page entirely at your own risk. 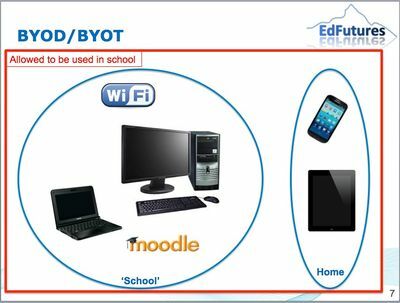 This page provides some guidance for schools that are thinking about moving towards a 1:1 or BYOD/BYOT digital technology strategy. This advice relates to trends in practice related to digital technology use that we have identified. A great deal has been written about the importance of having a shared educational vision (e.g. DfES, 2004; Fullan, 1992; National College of School Leadership [NCSL], 2003, 2004) and this is recognised as the first of several necessary conditions for leveraging technology to enhance and transform learning (International Society for Technology in Education, 2008; Van de Brande et al., 2009). 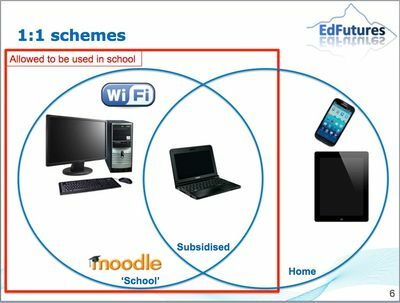 Wanting every pupil to have their own mobile device is NOT an educational vision. In every school we have visited there was a need for even more pedagogically focussed professional development. This links in with the need for a shared vision - the professional development shouldn't be about the technology, it should be about achieving your vision and how the technology will help you do that. It should be about how the technology will be used in practice - not about how to push the buttons. Of course staff and students do need to know how to operate the technology, but this is generally much easier than understanding how to use it effectively to support learning. I would strongly advocate developing structures and practices that support practitioner research and enhance sharing of experiences between teachers (both within your school and with the wider education community). We can say with a high level of certainty that you need to have a robust wireless network infrastructure if you are moving towards 1:1 BYOD or BYOT strategies. The majority of school will need to enhance their existing wireless infrastructure so that it can cope with multiple mobile devices accessing it simultaneously. Your existing infrastructure is very unlikely to be adequate. It seems very clear that there is no single device that is adequate in every educational situation in schools. So even if your students have their own mobile devices you will need to provide some 'specialist machines' for specific tasks (e.g. with specific (expensive) software). However, there will be times when students need access to a more powerful machine, with specialised software and/or a keyboard and/or a larger screen and/or specialist peripherals. It seems fairly certain that your school cannot afford to fund all of the digital technology you will need. We can say with a high level of confidence that where students (and staff) feel they have ownership of their mobile devices the way in which they engage with them and the level of use will be better than where they do not feel ownership of the devices. Any approach which gives the teacher control of the device, e.g. being able to spy remotely on what the student is doing, lock their screen, or remotely control what the device will undermine students' perception of ownership. Where students have other mobile devices at home they are less likely to feel ownership of a school device (even where their parents have made a contribution to the cost of it). I've only given this a confidence rating of Quite High because you can achieve a great deal without every student having their own device. Indeed some of the most interesting and effective practice I have seen has involved a mix of school desktops and laptops with some students bringing in their own devices. The key in these situations seemed to be that devices were readily available whenever needed - staff and students did not have to pre-book the machines - they had easy access to devices where they were working when they needed them. DfES (2004). National standards for headteachers. London, Department for Education and Skills. Fullan, M. (1992). Causes/Process of implementation and continuation. In N. Bennett, M. Crawford, & C. Riches (Eds. ), Managing change in education: individual and organisational perspectives (pp. 109-131). London: Paul Chapman Publishing. National College of School Leadership (2003). NPQH Access Stage Unit 1.2: vision into action. Nottingham, UK: NCSL. NationalCollege of School Leadership (2004). NPQHDevelopment Stage Unit 1.I: developing a strategic educational vision.Nottingham, UK: NCSL. Van deBrande, L., Carlberg, M., Good, B. (2009). Learning,innovation and ICT.Lessons learned from the ICT cluster, Education and Training 2010 Programme. Brussels: European Commission.